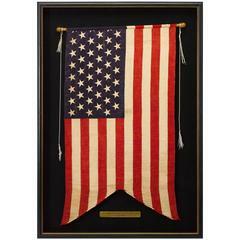 RARE CIVIL WAR PERIOD FEDERAL STANDARD STYLE FLANK GUIDON OF THE 100TH NEW YORK VOLUNTEER INFANTRY, HAND-PAINTED AND GILDED ON SILK, 1862-1865: During the Civil War, U.S. Army regulations set forth that an infantry unit would carry two flags. These included a national colors, meaning the Stars & Stripes, and a regimental colors, also referred to as a federal standard. This second flag, when issued by the federal government, displayed a federal eagle with a shield upon its breast, bearing the typical arrows and olive branches gripped in its talons, displayed on a blue ground, with an arch of stars above. The eagle had a red streamer in its beak with the E Pluribus Unum slogan, and another below the entire device, left blank so that a unit designation could be added after the flag was issued. Both the national and regimental colors were trimmed on three sides with gold silk fringe. When the war broke out in 1861, the federal government did expand the regular army, but mostly it relied upon local volunteer units that were organized on state level. These were equipped by the states themselves, or else by wealthy persons or organizations wishing to donate to the Union cause. States supplied both types of colors. A great deal of variation followed as both government and independent flag-makers interpreted the regulations and formats differently, and states provided input that sometimes altered the imagery to include state-associated symbols. Pennsylvania, for example, generally followed the federal format, while Connecticut merged the Federal eagle with state symbolism. In some instances the federal eagle was painted on one side and the state crest on the other. And in some cases the regimental flag had the state device only. Interpretations of devices of all kinds varied by maker and artist. In early 1862, the federal government retook the responsibility for the provision of regimental colors. But private groups or individuals that raised units often had their own flags made and presented them in formal ceremonies. These usually did not follow the form of federal standards at all, but rather put forth their own designs, including localized references by way of slogans, figures, landscapes, etc., plus eagles in various forms and a myriad of patriotic and military symbols. State and local militia groups that existed pre-war had their own flags that could either be carried as-is, or retired so that new flags could be produced for Civil War service. In either case these would often bear devices, dates and references specific to the history of the unit itself. Many of these units were comprised of veterans of other wars. Many were immigrants and the nationalities of their membership were conveyed in words or symbols on both their regimental standards, as well as in the cantons or stripes of their national colors. As a result of the above, the breadth of designs carried by units varied extensively and the inconsistency of it even within a state, let alone across states, was rampant. The same was true of uniforms. Regimental colors in the form of a federal standard were typically 6 x 6.5 feet (72 x 78 inches) for an infantry unit, which mirrored the size of their national colors. Cavalry units carried a much smaller standard that typically measured around 2.25 x 2.5 feet (28 x 30 inches). The infantry examples typically bore the full count of stars above the eagle, while the smaller variety displayed 13 stars. This was consistent with United States Navy practice on small versus large scale ensigns. Like their designs, measurements of all flags fluctuated from one maker to the next and by way of human error during assembly. This particular flag is of the cavalry sized variety, but was assigned to the 100th New York Volunteers, which mustered into service at Buffalo between September of 1861 and February of 1862. Also known as the Second Regiment, Eagle Brigade or the Third Buffalo Regiment, the unit received its official designation from the state as the 100th New York Volunteer Infantry on February 5th, 1862, so the flag was probably issued after that time, or else was left blank until the title was given. When a regimental colors was issued to a unit, it was up to the commanding officer to have the unit name painted onto the red streamer beneath the eagle. It didn't always happen, perhaps due to available time or materials, but in this case the name was boldly added in the appropriate and expected fashion. The lettering is congruent with the age of the flag and when this is true, a unit name adds significant interest through firm documentation of provenance. In New York state there were so many volunteer units that naming, organizing, re-naming and equipping regiments was a nebulous task. The supply of flags and logistics of distribution was simply outstripped by demand. For this reason, the colors usually assigned to cavalry units sometimes ended up with infantry and artillery units, carried as guidons / flank markers, used to align troops in formation as well as in battle. At the same time, camp colors, which marked the perimeter of a unit's camp, were sometimes acquired as flank-markers. Because the scale of a cavalry regimental standard was virtually identical to infantry flank-markers, this flag was certainly issued for that purpose or as a general guide flag, carried by some units for the same purpose in the front center of the formation. Because New York infantry guidons were usually quite bland by comparison, in blue with gold letters "N.Y.S.M." painted above the numeric identification and the word "Regiment" below, this flag would have contributed an extra degree of flare to this hard-fighting assemblage of 960 New Yorkers, who left Buffalo for Washington via New York City on March 7th. Here they attached to the 1st Brigade, 3rd Division, 4th Army Corps, Army of the Potomac and went on to participate in an extraordinary list of battles and skirmishes. When the 3-year term of enlistment was up, many of the men heeded Lincoln's call to re-enlist and the regiment went on to serve throughout the war. From a total strength of 1,491 men over approximately 3.5 years, it lost during service 12 officers and 182 enlisted men to death and mortal wounds from combat, plus 1 officer and 202 enlisted men to disease for a total of 397. 80 of these men (79 enlisted and 1 officer) died in the hands of the enemy. The 100th participated in the chase of Lee to Appomattox and was present at his surrender on April 9th, 1865. In July, 1865, it was consolidated with the 148th and 158th N. Y. and was finally mustered out on August 28th at Richmond. At the outset of the Civil War, regulations stated that battle flags were supposed to be embroidered on silk, but very few were. This was due to the lack of skilled embroiderers. Although there were prototypes, the embroidery machine had not yet been successfully invented and even though success on that front was achieved in Switzerland just three years later, in 1863, none were imported to the U.S. until 1873. The result was that flags were instead hand-painting on silk, which certainly resulted in at least one key benefit, because painted flags were much lighter to carry. As the late flag expert Howard Madaus once explained, "Because the a regimental flag was often the only trace of a unit visible on the smoke-choked field of battle, it drew an inordinate amount of enemy fire [and] accordingly, casualties were thickest closest to the colors." Like most regimental flags, this one is hand-painted on a silk ground. The background is Navy blue and the gold stars, scrollwork and accenting are richly executed in gold leaf. Hand-painting allowed for great detail and colorful embellishment, both of which are present here, with ample inflection of lighting through subtle shading. Like most of its counterparts of this scale, the presentation is bold and interesting, because the device is so large with respect to the size of the flag. The fringe is also more prominent and the size is much easier for a collector to display, which raises interest in its own right. 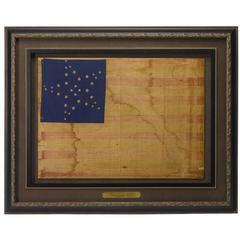 Civil War battle flags such as this one are very rare and those with unit designations are even more so. Following the war, most regiments presented their flags back to their respective states in formal ceremonies. In New York State this occurred on July 4th, 1865. This probably explains why none of the flags of the 100th were given, as they remained in Virginia and didn't muster out until August. So far as I am aware, no others belonging to the regiment are known and none have been acquired by the New York State Military Museum, which eventually took possession of most of these flags as well as those consolidated from various armories and private donors, and houses more than 2,000 flags dating from the War of 1812 to the present. Five similar examples of federal standards in the same basic size as this flag are present in the New York Military Museum collection and are illustrated on their website. One is unattributed and no unit designation is painted on it, one was issued to the 1st Regiment NY Dragoons, one to the 16th NY Cavalry, and two to the 25th NY Cavalry. Four of the above appear to have been produced by the same maker as the flag under examination here, while the other has deteriorated too much to be identified, having only 15% or so of the blue ground present and virtually none of the eagle. A recorded history of the regiment does speak of a presentation regimental standard belonging to the 100th. According to a 1908 book entitled "The Union Army: A History of Military Affairs in the Loyal States, 1861-65": "The regiment was present at all the operations about Charleston harbor during the spring of 1863, and, under the command of Col. Dandy, engaged in the desperate assault on Fort Wagner in July. While the assault was unsuccessful the regiment behaved with signal gallantry, planting the flag presented to it by the Board of Trade of Buffalo, on the fort, though at a fearful cost of life. The brave color-sergeant fell dead beside the colors, and the regiment sustained a loss of 49 killed, 97 wounded and 29 missing—a total, of 175 out of 478 engaged." In 1884 the flags presented to the 100th New York Regiment by the Board of Trade of Buffalo were presented to the Buffalo Historical Society for safekeeping. A heartwarming record of the action and related speeches were recorded in the "Annual Report of the Board of Managers of the Buffalo Historical Society, January 13th, 1885," a copy of which will be included with the flag. Evidently, because this small scale federal standard was not presented by the Board of Trade of Buffalo, the flag was not presented with the other colors. It may have not even been present with the veterans at this time, having been gifted to the color bearer or to an officer or to some other party at an earlier date. Due to the Civil War date, exceptional colors and graphics, rarity, small yet boldly displayable size, and specific history to a unit from one of the wealthiest and most populated states in America, this is a masterpiece level object among its 19th century counterparts and a great addition to any collection. Two Consolidated Histories of the 100th New York Volunteers: 1. Source: Phisterer, Frederick, "New York in the War of the Rebellion, 3rd Edition," (1912, J. B. Lyon Company, Albany). "Under the supervision of Gen. G. A. Scroggs, recruiting for this regiment, as one of his brigade, was commenced September 2, 1861. It was organized at Buffalo, and there, mustered in the service of the United States for three years, between September, 1861, and January, 1862, with James M. Brown as Colonel. It received its numerical volunteer designation February 5, 1862. At the expiration of its term of enlistment, the men entitled thereto were discharged, and the regiment retained in service. The companies were recruited principally: (A) at Buffalo, Franklinville, Springville and Ogdensburg; (B) at Attica, Batavia, Bergen, Caledonia, East Pembroke, Greenwood, Greigsville, Jamestown, Le Roy, Lodi, North Hector, Pearl Creek, Persia, Pavilion and Victor; (C) at Buffalo, Brighton, Pembroke, Rochester and White's Corners; (D) at Buffalo, Grand Island, La Salle, Tonawanda and Wheatfield; (E) at Buffalo, Brocton, Cattaraugus, Dunkirk, Mayville, Portland and Westfield; (F), originally intended for the Astor Regiment, and (G) at Buffalo; (H) at Buffalo, Arkwright, Cherry Creek, Ellington, Hanover, Irving, Silver Creek, Smith's Mills and Villanova; and (I) and (K) at Buffalo. The regiment left the State March 10, 1862; served in Naglee's Brigade, Casey's Division, 4th Corps, Army of the Potomac, from March, 1862; in the 1st Brigade, 2d Division, 4th Corps, Army of the Potomac, from May, 1862; at Gloucester Point and Yorktown, Va., from August, 1862; in Naglee's Brigade, 1st Division, Department North Carolina, from December, 1862; in Davis' 2d, Brigade, Naglee's, 2d, Division, 18th Corps, in South Carolina, from January, 1863; at St. Helena, S. C., from February 12, 1863; on Cole's Island, S. C., 18th Corps, from March 24, 1863; on Folly Island, S. C., 10th Corps, from April 3, 1863; on Morris Island, S. C., from July 10, 1863; in Terry's Division, 10th Corps, from October, 1863; in Stevenson's Division, 10th Corps, from January, 1864; on Morris Island, S. C., from February, 1864; in 2d Brigade, 1st Division, 10th Corps, Army of the James, from April, 1864; in 3d Brigade, 1st Division, 10th Corps, from May, 1864; in same brigade and division, 24th Corps, from December, 1864; in 2d Brigade, 1st Division, 24th Corps, from May, 1865; and it was honorably discharged and mustered out, under Col. George B. Dandy, August 28, 1865, at Richmond, Va. During its service the regiment lost by death, killed in action, 9 officers, 115 enlisted men; of wounds received in action, 2 officers, 68 enlisted men; of disease and other causes, 3 officers, 20 enlisted men; total, 14 officers, 384 enlisted men; aggregate, 398; of whom 1 officer and 79 enlisted men died in the hands of the enemy. 2. Source: "The Union Army: A History of Military Affairs in the Loyal States, 1861-65 -- Records of the Regiments in the Union Army -- Cyclopedia of Battles -- Memoirs of Commanders and Soldiers" (1908, Federal Publishing Company, Madison, WI), Vol. II. "One Hundredth Infantry.—Cols., James M. Brown, George F. B. Dandy; Lieut.-Cols., Phineas Stanton, Calvin N. Otis, Louis S. Payne, Warren Granger; Majs., Calvin N. Otis, Daniel D. Nash, James H. Dandy, George H. Stowitz, Frederick A. Sawyer. The 100th, known as the 2nd regiment, Eagle brigade, or the 3d Buffalo regiment, was principally recruited at Buffalo, where it was organized, and mustered into the U. S. service from Sept., 1861, to Jan., 1862, for three years. This regiment is included by Col. Fox among the "three hundred fighting regiments" of the war and earned its reputation for gallantry on many a hard fought field. It left the state for Washington on March 10, 1862, 960 strong, and soon after its arrival was assigned to Naglee's (1st) brigade, Casey's (2nd) division, 4th corps. It joined in McClellan's Peninsular campaign, its losses at Fair Oaks being particularly severe—176 killed, wounded and missing. Col. Brown was killed here and Col. Dandy, of the regular army, was assigned to the command of the regiment. At the conclusion of this campaign it was stationed for several months at Gloucester point and Yorktown, and then moved with its brigade to North Carolina. The regiment was present at all the operations about Charleston harbor during the spring of 1863, and, under the command of Col. Dandy, engaged in the desperate assault on Fort Wagner in July. While the assault was unsuccess-. ful the regiment behaved with signal gallantry, planting the flag presented to it by the board of trade of Buffalo, on the fort, though at a fearful cost of life. The brave color-sergeant fell dead beside the colors, and the regiment sustained a loss of 49 killed, 97 wounded and 29 missing—a total, of 175 out of 478 engaged. . Its loss here of 66 killed and mortally wounded amounts to over 13 per, cent. of those in action. During the subsequent siege of Fort Wag-ner its losses were 11 killed, 31 wounded and 7 missing. It next took part in the operations in Charleston harbor from September, to December, attached to Terry's division, 10th corps, but sustained, no further losses in action. In . Plaisted's brigade, Foster's (1st) division, 10th corps, the regiment sailed up the James river in May, 1864, with the Army of the James, under Gen. Butler, and took part during that month in the operations against Petersburg and Richmond, engaging the enemy at Port Walthall Junction, Chester Station, Swift creek, Procter's creek, Drewry's bluff and Bermuda Hundred. Its, losses during this campaign were again very heavy, . amounting to 280 . in killed, wounded and missing. It was next engaged in the assault on the works of Petersburg; the battles of Deep Bottom, Strawberry Plains, Fort Harrison, Darbytown road and Fair Oaks. In the action at Strawberry Plains, it lost 81 in killed, wounded and missing, at Pair Oaks, the loss was 17, and while in the trenches before Petersburg it met with frequent casualties, aggregating 28 killed, wounded and missing The l0th corps was discontinued in Dec., 1864, and the regiment became a part of the 3d (Plaisted's) brigade, 1st (Terry's) division, 24th corps. It was actively engaged at the fall of Petersburg, April 2, 1865, when it made a gallant and successful assault on Fort Gregg and sustained a loss of 59 in killed and wounded; among the former was Maj. James H. Dandy, a brave and efficient officer. It then participated in the pursuit of Lee and was present at Appomattox. On the expiration of its term of enlistment the original members, except veterans, were mustered out, and the regiment, composed of veterans and recruits, continued in service. In July, 1865, it was consolidated with the 148th and 158th N. Y., and was finally mustered out of service, under Col. Dandy, Aug. 28, 1865, at Richmond, Va. Corp. John Kane was awarded a medal of honor for gallantry. Its loss during service was 12 officers and 182 enlisted men killed and mortally wounded; 1 officer and 131 enlisted men died of disease and other causes; 71 enlisted died in Confederate prisons—total, 397, out of a total strength of 1,491." Frame Size (H x L): 44.75" x 47" Flag Size (H x L): 31" x 33"
Rare and in good condition, 18th century British cavalry armour breastplate. Steel plate with cloth to the front. Two separate pieces with leather and metal hinged straps.